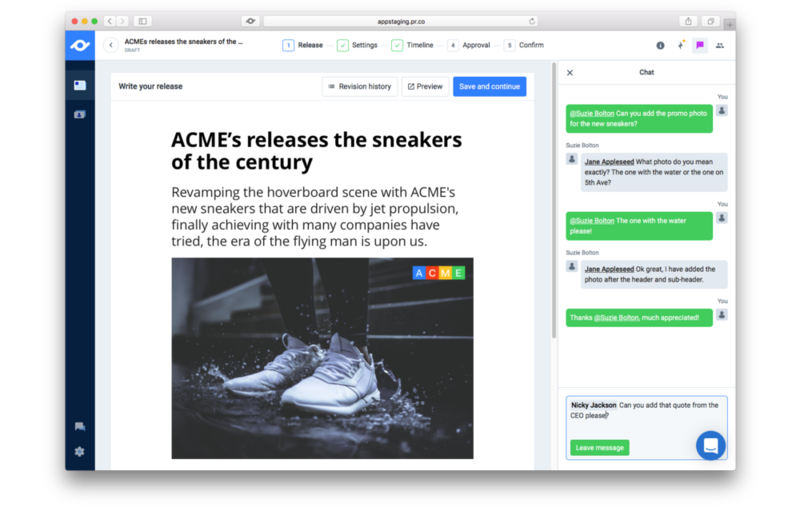 Today pr.co is launching their most advanced Campaign editor to date, with a heavy focus on collaboration and advanced outreach capabilities. After the User Interface and Navigation update from last June it was time to upgrade pr.co's Campaign editor to the same level of quality. 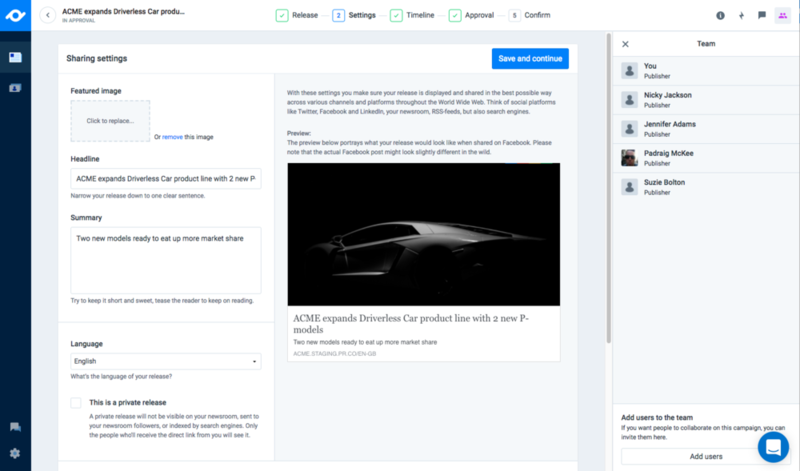 In order to achieve this we've completely redesigned and rebuild the editor, resulting in the fastest, easiest and most advanced Campaign editor we have ever built. The Campaign editor is at the heart of pr.co and for a lot of people the cornerstone of their working day. It had to be the most optimal experience possible but also be ready for the future. The ambition was to design an editor that lasts for years and can accommodate for all upcoming features on our roadmap. For example; one of these new features is scheduling social media updates. We had to look for a way to get all scheduled outreaches into one screen while keeping a clear overview. For this new editor we have made collaboration one of the main pillars of the designs. This results in a seamless experience between writing your campaign, handing it over to a colleague, or starting an approval round. 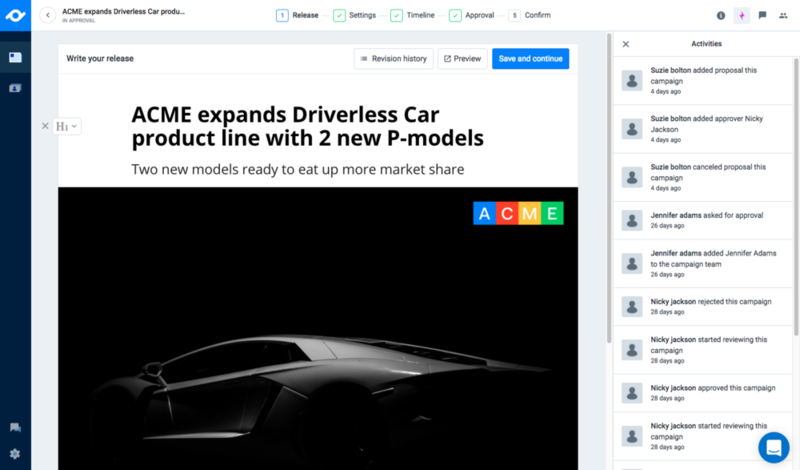 We've also added new collaboration features to make working together even easier in pr.co. 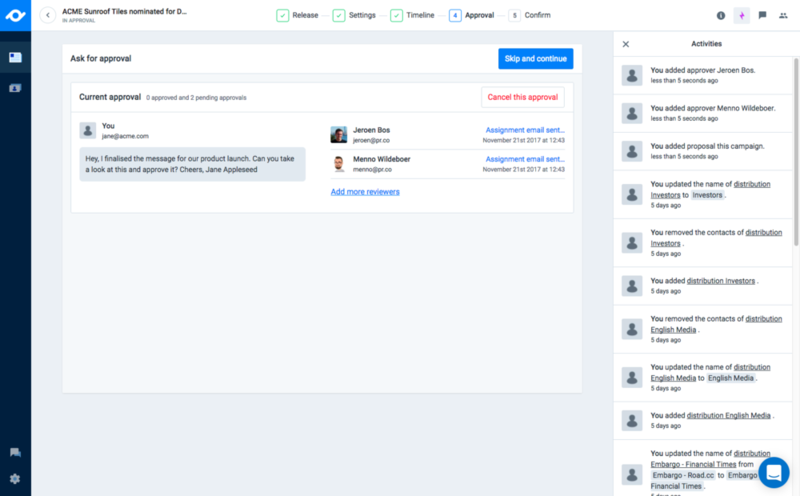 The new review-mode is a dedicated page where a reviewer can review the full campaign in one single screen and then either approve or reject at the end. 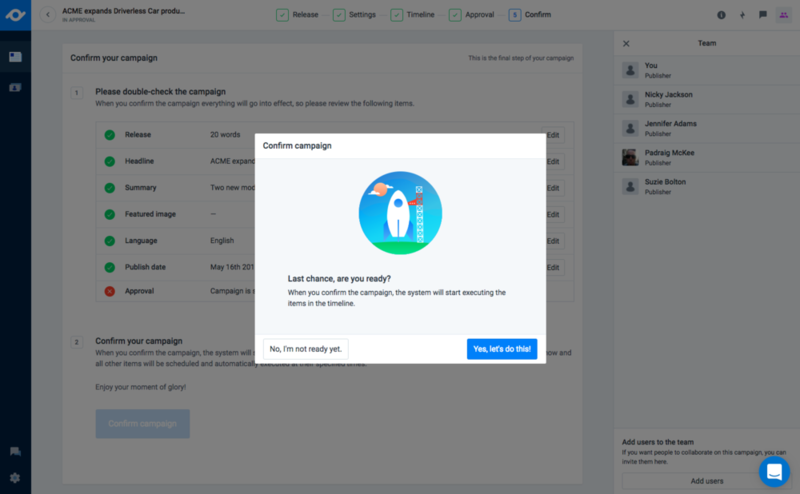 Previously a reviewer had to find their way through all the various campaign steps themselves and find the approve-button themselves. 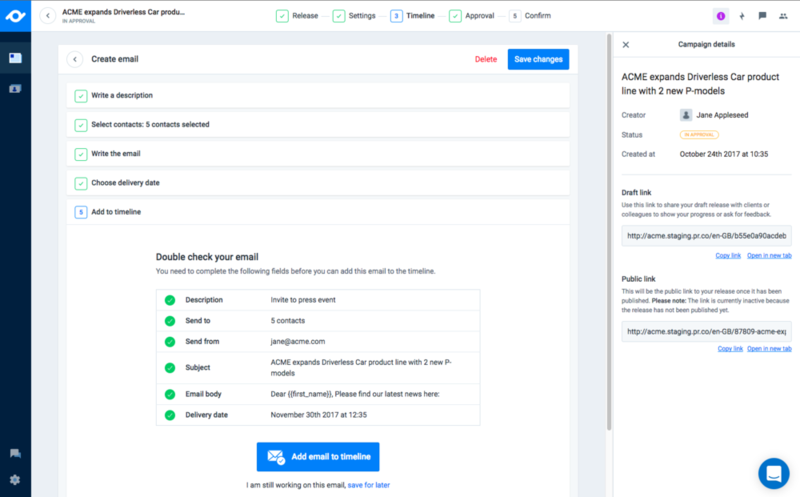 Now, reviewers will receive their approval assignment email, click straight through to the review-mode and can finish their task on that same page. This results in faster approval rounds and a lot less friction for the reviewers. Another brand new feature is the Chat, this allows the campaign team to discuss their work directly from inside of the pr.co app. 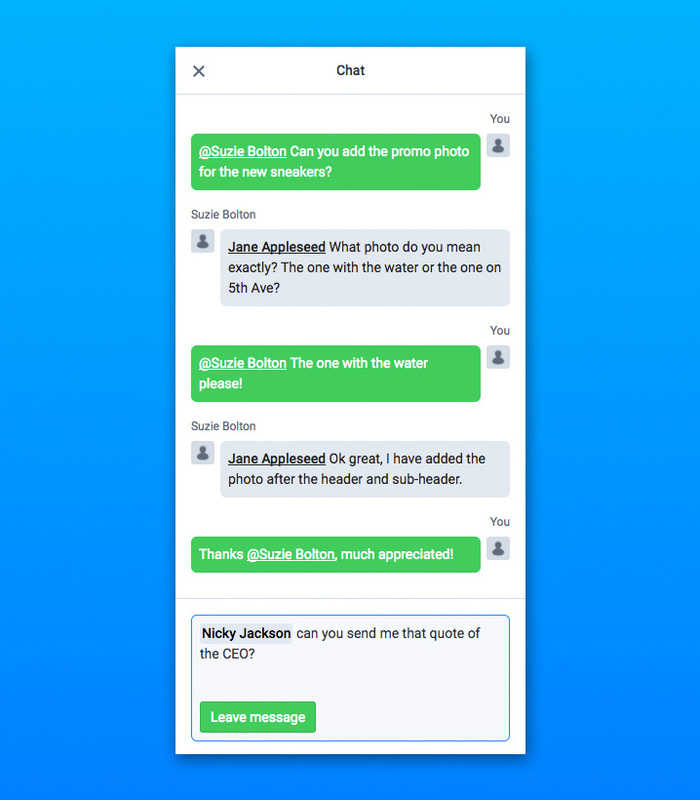 We've designed the Chat to have a familiar look and feel to modern chat/messenger services like WhatsApp, iMessage or Facebook Messenger. The new Activity feed will be live updated as you work on the campaign and link you to the steps concerning each activity. For example: if someone saved a new version of the release, you can click right through to that particular revision. As you start working together with your team it is important that you don't overwrite each others work while also keeping a pleasant experience. Our new view-only mode will make sure this is the case. The moment you enter a step in a campaign that one of your colleagues is currently working on, you will enter that step in view-only mode. Here you can wait for that person to finish their work while the system automatically hands the write-mode over to you. 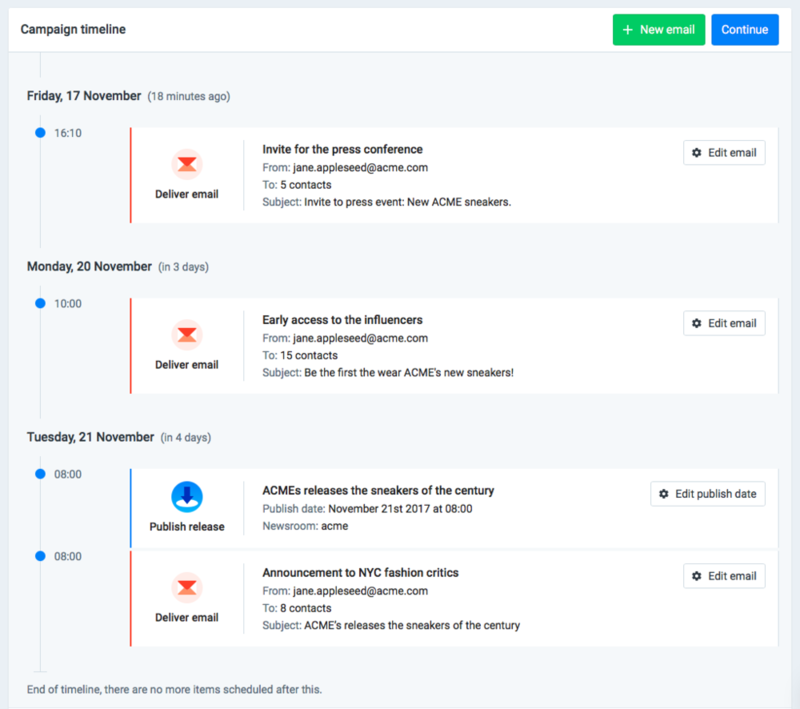 Previously you would only be able to send Email distributions when the campaign got launched or when the release got published. With the new timeline feature you are now able to send emails at any desired time. The timeline is basically a chronological todo-list for the pr.co system to execute your communications. An email to your VIP contacts a few days in advance. An email asking your investors to share your news when it gets published. And then finally a big push to the general media.